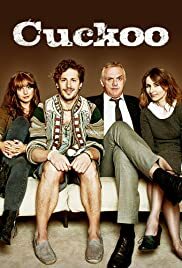 How many episodes of Cuckoo have you seen? Awesome Fresh Comedy that the Whole Family could Enjoy! What a truly funny, really funny, show! Where to start? Well if you're a fan of Andy Samberg (That's My Boy, Hot Rod) then there's a pretty good chance this'll quickly become your favorite new comedy! Even if you have no idea who he or any of the other cast are, well I'd still be willing to bet you'll get at least one, really good, laugh out loud moment per episode. The cast are awesome, particularly the on-screen chemistry from the two leading men. Add to that the fact you can root for both characters, and at the same time! Well what more can one want from this funny and amazingly written gem? I've got to say, I was pleasantly surprised at how well Cuckoo addresses modern families and relationships through comedy. We've come a long way from the classic stigmata of working man, stay at home wife and kids, etc. Well, Cuckoo gives us a pleasant look at one type of modern family environment and relationships, that many either have experienced (first or second hand) or will very likely experience themselves at some point in their journey of life across this modern yet ever changing world. Before you judge it, give it an episode, or two or many :) Just remember what comedies are for, unwinding and having a laugh at other people and their predicaments. I personally find having experienced something like Cuckoo first hand only adds to the show/scenario and makes it even funnier. I'm sure many will relate to it on many different levels. My idea of comedy? Well here's some other funny TV shows I enjoy/ed; South Park, Crank Yankers, Bored To Death, Chuck, Fonejacker, That '70s Show, Wilfred, Robot Chicken, Workaholics, IT Crowd, Family Guy, Futurama, Boston Legal, WKUK, Beavis and Butthead (new season) -- there's a ton more but that's a pretty diverse list of shows that have all, at one point or another, had me (quite literally) in tears laughing.